If you have OpenWrt installed on your home router and you’d like to have a backup internet connection or a secondary WAN connection (e.g. to do a load-balancing between multiple WANs) then you might be interested in this post. second one from USB LTE modem Huawei E3272 with SIM card from Polish telecom operator Plus GSM. My router is Linksys WRT1900AC with OpenWrt 17.0.1 / LEDE on board. I also checked ifconfig and noticed that there was new interface named wwan0. For the rest of the article I’m assuming that second network interface is named wwan0 – in your case it might be different, so please adjust. Some operations might work without reboot, but rebooting after changes gives you a certainty that all the configuration was reloaded during boot-up. In my case whole reboot operation is like 20 - 25 seconds long so it’s not a big pain. daemon.notice netifd: wan2 (16649): sending -> AT+CGDCONT=1,"IP","internet"
daemon.notice netifd: wan2 (16649): sending -> AT^NDISDUP=1,1,"internet"
After you’ve tested the connectivity you can move to Multi-WAN configuration. This is done by using the mwan3 package. In my case, upgrade of mwan3 package was required. My E3272 required NCM drivers and mwan3 version (2.0.x) coming from OpenWrt/LEDE 17.x was too old. It had problems with recognizing the wan2 modem-based interface. to the configuration file located at /etc/config/mwan3. 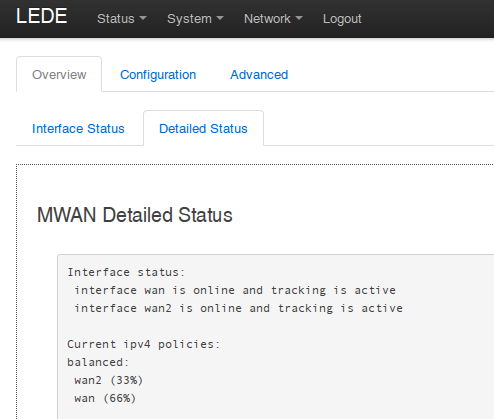 You need to remember to add metric to each WAN interface as this is required for mwan3. Now you can assign a proper “weight” to each interface – you can do it from LuCI if you’ve installed previously mentioned packages. You can set it to 50/50 (fair traffic distribution), 25%/75% or whatever option suits you. Thanks a lot to eko.one.pl for being such tremendous source of knowledge!